The ship, known as the President Warfield, was purchased secretly in Baltimore by Haganah operatives in 1946 for $40,000. It had been used for pleasure cruises by the Baltimore Steam Packet Company from 1928 until 1942 before being requisitioned by the U.S. Navy for operations in World War II. After the war, it was sold for scrap. The Haganah, which had been using smaller ships for their clandestine Jewish immigration, decided it needed a larger ship to start moving thousands of refugees. The ship was 330 feet long with a capacity of roughly 500 passengers. 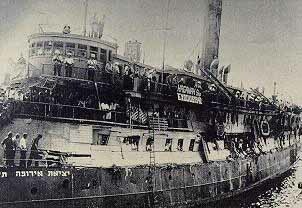 It was renamed the Exodus 1947 at the suggestion of Moshe Sneh, who at the time headed illegal immigration for the Jewish Agency. The initial crew of more than 40 men consisted mostly of American Jews with no sailing experience in boarded the ship in Baltimore. They were later joined by members of the Haganah and Palmach commanded by Aliya Bet veteran Yossi Harel. Yitzhak “Ike” Aronovitz, a 23-year-old sailor, originally from Danzig, was the captain. The Haganah retrofitted the ship to accommodate more than 4,000 people, added defensive measures, such as netting, fencing and pipes for oiling the deck to slow down boarding soldiers, and loaded it with provisions for a seven-day voyage from France to Palestine. Grauel was put on the ship for one purpose — because it was very probable the British were going to be able to take the Exodus. It was the largest effort ever done in terms of movement of refugees. So, if the ship was taken, somebody has to get the information out,” Klinger said. “They said he was a journalist. What his real job was, if the ship was taken, was to tell the story. Because they knew people wouldn’t believe the story if a Jew told it. But what if a Christian told the story? It would be received differently, and that’s exactly what happened. The ship sailed from the port of Sète, near Marseilles, on July 11, 1947, with 4,515 immigrants, including 655 children, on board. Several babies were born during the week-long journey. One woman, Paula Abramowitz, died in childbirth. Her infant son died a few weeks later, in Haifa. As soon as it left the territorial waters of France, British destroyers accompanied it. On July 18, near the coast of Palestine, but outside territorial waters, the British rammed the ship and boarded it, while the immigrants put up a desperate defense. Explosions and gunfire were heard, bumps and shocks were felt as the British ships knocked our ship. Teargas bombs penetrated the inner decks. My dad pulled out some handkerchiefs, wetted them with water from the canteen and handed them to us. … The jerking grew more and more frequent, more tear gas penetrated the ship, more shooting occurred. Suddenly we saw people covered in blood streaming towards the inner deck. During the fighting that ensued after the British boarded, American Mahal volunteer Bill Bernstein was clubbed to death in the wheelhouse. Two immigrant passengers died of gunshot wounds and dozens were wounded. To avoid further bloodshed, ship commander Harel and captain Aronovitz surrendered the ship and the British towed it to Haifa. Heartbreakingly close to their homeland, the immigrants were forced onto three deportation ships, the Runnymede Park, Ocean Vigour and Empire Rival on July 19. Instead of sending them to Cyprus, where other illegal immigrants were imprisoned, British Foreign Minister Ernest Bevin decided to make an example of the Exodus to try to discourage future attempts to reach Palestine and ordered the refugees to be sent back to France. At Port-de-Bouc, in southern France, the would-be immigrants remained in the ships’ holds for 24 days during a heat wave, refusing to disembark despite the shortage of food, the crowding and the abominable sanitary conditions. The French government refused to force them off the boat. After three weeks of the standoff, the British decided to return the would-be immigrants to Germany, and on August 22 the ship left for the port of Hamburg, then in the British occupation zone. The immigrants were forcibly taken off and transported to two camps, Poppendorf and Am Stau, near Lubeck. The site of Jewish survivors of the Holocaust being forcibly relocated to Germany caused an international uproar. World public opinion was outraged and the British changed their policy. Illegal immigrants subsequently were not sent back to Europe; they were instead transported to detention camps in Cyprus. On September 29, 1947, the Irgun and Lehi blew up Central Police headquarters in Haifa in retaliation for the British deportation of the Exodus passengers. Ten people were killed and 54 injured. The deportees were moved in November 1947 to Sengwarden near Wilhelmshaven and Emden. Of the 4,500 would-be immigrants to Palestine there were only 1,800 remaining in the two Exodus camps by April 1948. Many of the former passengers retried to reach Palestine and most succeeded by the time Israel declared independence on May 14, 1948. Others ended up in detention in Cyprus. All the detainees of the Cyprus internment camps were transferred to Israel when Britain formally recognized the State of Israel in January 1949. The United Nations Special Committee on Palestine was in Palestine conducting its investigation to determine how to resolve the conflicting demands of the Zionists and Arabs. The treatment of the Exodus refugees apparently influenced some members to advocate a solution that would allow Jews to immigrate freely to a state of their own. The captain of the Exodus, Ike Aronovitz, later founded his own shipping company. He died in Israel on December 23, 2009, aged 86. Yossi Harel, the commander, went on to serve in Israeli intelligence and became a successful businessman. He died in Tel Aviv on May 1, 2008, aged 90. 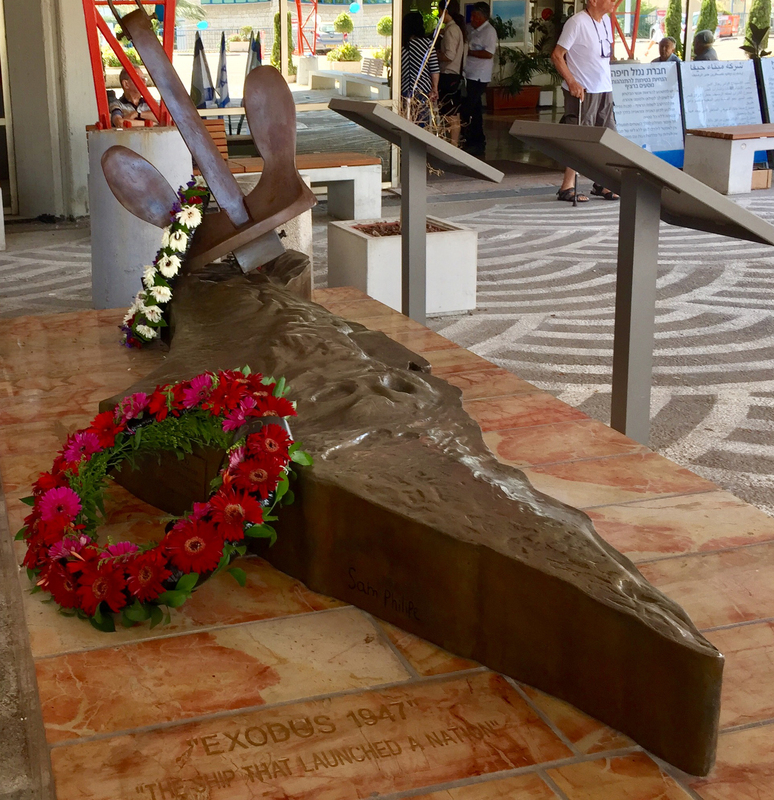 On July 18, the 70th anniversary of the British attack, a memorial to the Exodus was unveiled in the International Cruise Ship Terminal in Haifa. Among the guests were Yossi Harel’s daughter and Ike Aronovitz’s family. Ruth Gruber, “Ruth Gruber: Witness for the World,” American Photo, (September 28, 2012). Memorial photo courtesy of Jerry Klinger.